Direct from Bristol, Bath & London. We are pleased to be presenting new paintings from artist Doris A. Day. Following his recent solo exhibition 'The Project of Anxiety' at The Agency Gallery, London, Doris is taking the next step in his continued exploration of capturing the image. 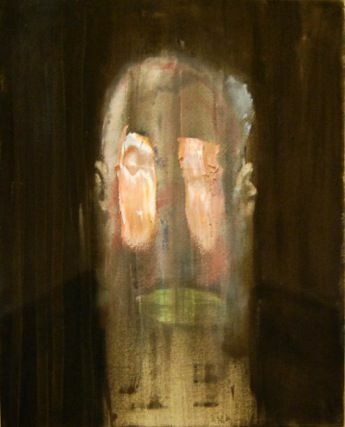 In the vain of Francis Bacon's âincomplete' studies of the screaming pope that were for Bacon a way of connecting to Velazquez' hand, we find Doris in a similar process that is somewhere between portraiture and ritual. Without the visual aid of examples, only memory, Doris A. Day is forced to delve deeper into his mind and produce images that aren't replication but lie closer with the performance and a re-vision as a sort of self portrait. The exhibition will continue from 22 September to 6 October. Opening times: Fridays & Saturdays, 1:00pm - 5:00pm We will be open 1:00pm - 3:00pm this Saturday 22nd, then close from 3:00pm - 5:00pm for the opening of Foreground Projects - Brian Griffiths - The Kidd at The Frome Amateur Boxing Club, but re-open from 5:00pm for a late viewing until 6:30pm. -|- The Toolshed Gallery is an artist run contemporary arts project space in Frome, Somerset. Established in 2012 to provide a platform for local and national artists to exhibit in a different context. We invite artists to exhibit work in both a complete and transitional stage to create a forum for discussion and experiment.